Not only does Minnesota have an absurd number of World’s Largest this and that, but it also boasts the World’s Oldest Rock. Yes, you read that right. The oldest exposed rock on the earth, right here in Minnesota, on the side of the road in the southwestern part of the state. Visible here are some rock outcrops near the Yellow Medicine County Museum just as you come into town from the east. 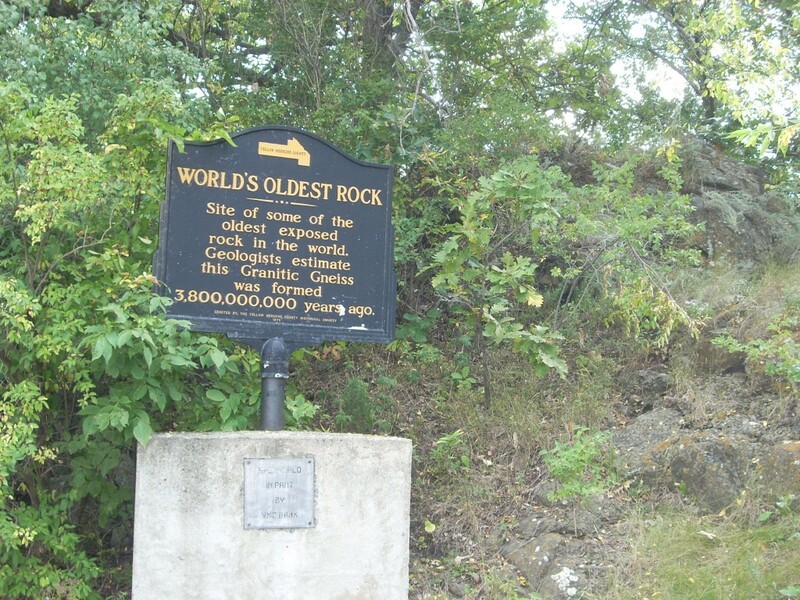 The exposed rock is 3.8 billion years old, which is impressive considering the earth itself is only 4.5 billion years. This rock was exposed from the mantle when Glacial Lake Agassiz emptied into the ocean during the last Ice Age. The draining of this impossibly huge lake apparently caused the ocean to rise 1-3 feet. Walk right up to it and touch a piece of true geologic history if you want. It’s free. While in the area: Upper Sioux Agency State Park is just down the riverway about 10 miles, which has hiking and horseback trails along the dramatic bluffs of the MN River Valley. This park also features authentic canvas tipis you can stay the night in, which are a nod to the Sioux heritage of the area. This entry was posted in Highway Highlights and tagged Granite Falls, Minnesota Geology, MN, World's Oldest by Seth5544. Bookmark the permalink. what is the name of world oldest rock?